New mom Kim Kardashian left her daughter North (aka Nori) back home in L.A. last week as she and Kanye West hit up the Paris Fashion Week shows. The celebrity mom and reality star is thrilled to be reunited with her baby girl this week. Kim took to Instagram this afternoon to share a new photo with her followers. Kim wrote, "I missed waking up with my little (angel symbol)". This is only the second time we're getting a glimpse of baby North West. 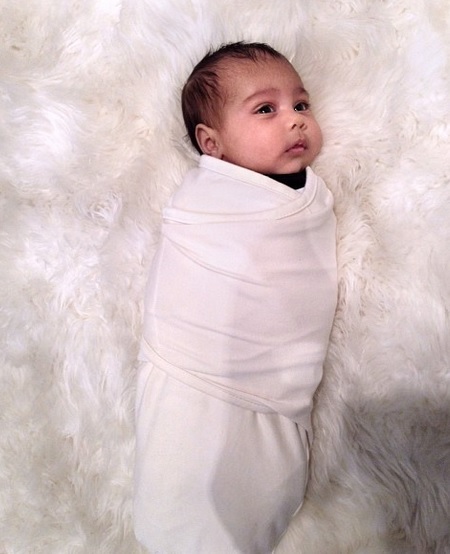 Kris Jenner shared the first photo of North back in August, two months after her birth. She is a sweetheart, isn't she?